Inkjet printing is a print method that can recreate photographic quality images and text using microscopic drops of ink. Ink is dispensed from tiny nozzles by applying heat or electrical charge, as well as pressure. This concept of printing dates back as far as the 1800s but technology had not sufficiently advanced enough until the 1950s. To use this method, you must use compatible discs, or you may get smudged or smeared results. 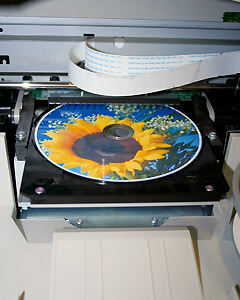 CD, DVD, and Blu-ray discs with printable surfaces benefit from high resolution and photo-like quality found in inkjet printing. Additionally, professions printing services may add an additional coat of lacquer to preserve integrity of artwork. This method is intended for both consumer and commercial purposes. Professional inkjet DVD and CD printers are priced at several thousand dollars and an at-home consumer will pay a few hundred dollars for one intended for short-run disc purposes. Inkjet printers have a shorter warm up time than other types, such as thermal printers. Printing discs may take up to 4-5 minutes, so this method is better for smaller orders and when there isn’t a strict or fast approaching deadline. Also, color matching can be a challenge because it lacks support for the Pantone color palette. There are two types of inkjet technologies: continuous inkjet (CIJ) and drop-on-demand (DOD). DOD also has two additional methods (thermal and piezoelectric) and both are used more frequently than CIJ. Piezoelectric types are more typically found in commercial and industrial markets while thermal DOD can be found in at-home printer models. CIJ uses a continuous stream of ink supplied to the print head by a pump and a piezoelectric nozzle cycle. A gutter near the medium’s surface catches extra ink droplets and returns unused ink to a waste tank. Drop-on-demand uses both thermal and piezoelectric processes. Thermal DOD heats a conductive part of the printer called a resistor. The increase of heat causes an air bubble to form which pushes the ink forward and out of the nozzle. Canon, HP, and Lexmark have models that employ this method. Piezoelectric DOD uses expanding crystals and electrical currents to propel ink towards the nozzle’s opening to release it drop by drop. The composition of crystals produces an electrical field when they are charged. This accounts for crystal enlargement. Epson is known for using this method.